Well, it looks like Tropical Storm Danny (Previously Hurricane Danny) might be a bit of a disappointment for those of us hoping to get some rain out of this storm. While it still looks like it will hit us in the couple days, the rainfall is already decreasing. Hopefully there will be enough left by the time it gets here to ease our drought a bit. From the projections it looks like what is left of Danny will hit the lower part of the Dominican Republic. Still we might get a little up north. Seems kind of strange talking about a drought on a Caribbean island but for the last couple months many of the smaller towns in the country have been without water supplied from the city. That means that in addition to paying the city for water (which we don’t get), we also have to pay water trucks to come in and fill our tenacos and cisterns. That can get pretty expensive. 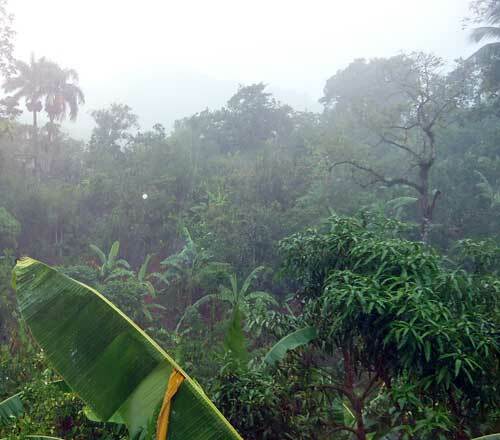 While it is good to finally see a little relief from the drought that has been plaguing the Dominican Republic, the same rain also means flooding in some areas due to the poor drainage in many communities and even in some of the larger cites. the storm that is coming in today is putting several areas on alert San Pedro de Macorís, La Romana, La Altagracia, El Seibo, Hato Mayor and Duarte (especially the Bajo Yuna area). If you are driving today it would be a good idea to slow down and be on the watch for water on the roads especially in any of the lower areas near creaks and rivers. The National Meteorological Office (Onamet) which forecasts that the system will bring moderate rainfall, which could be heavy at times, accompanied by thunderstorms and isolated wind gusts, starting in the eastern and northeastern regions. On Monday October 22 2012 Tropical depression Sandy strengthened into a tropical storm. 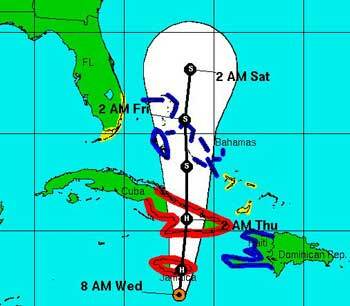 This storm is expected to pass directly over Jamaica and Cuba and reach the Bahamas Thursday of Friday. While still considered a tropical storm there is a good chance that Sandy will be a hurricane by the time it reaches Jamaica> Hurricane warnings are in affect for Jamaica and the Cuban provinces of Camaguey, Las Tunas, Granma, Santiago de Cuba, Holguin and Guantanamo. There are also tropical storm warnings in effect for Haiti, and the Central Bahama with a tropical storm watch in effect for the Southeast Bahamas and the NorthWestern Mahamas. At this time there is also a Tropical Storm watch for the southeast Bahamas, Florida Bay, the east coast of Florida from Jupiter Inlet to the Ocean Reef and the Florida Upper Keys from Ocean Reef to Craig Key. Sandy is expected to strengthen to a Hurricane before it reaches Jamaica later this afternoon and continue as a hurricane as it passes over Jamaica and Cuba. It is expected that Sandy will weaken to a tropical storm as it passes over Cuba and remain a tropical storm as it passes over the Bahamas Friday and Saturday (10/26/12 and 10/27/12). Maximum sustained winds are currently (as of 10/24/12) near 70 mph with the storm force winds extending outward 140 miles from the center of the storm. 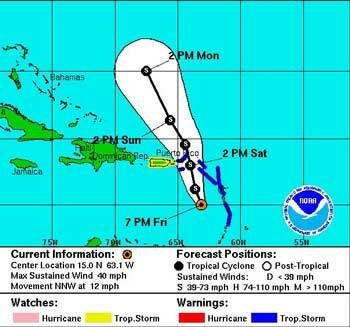 Maximum winds are expected to reach 80 mph as (what would be hurricane) Sandy passes over Jamaica. As an update to this report Hurricane Sandy has caused thousands of evacuations, road closures, school closures, canceled international flights from one of the Santo Domingo international Airports (Higuero International Airport (aili) north of Santo Domingo) and a country wide power outage. And this is only from being swept by one of the spires. 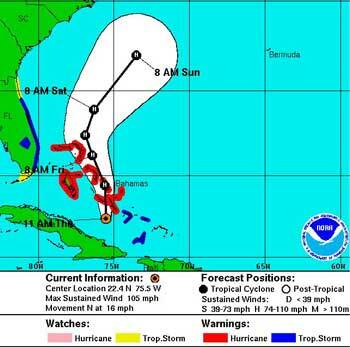 (For more information read Hurricane Sandy Slams the DR). The National Meteorological Office issued alerts today (10/22/12) for several towns due to saturated ground and a tropical wave that will be coming through today. Barahona, Azua, Bahoruco, Pedernales, Independencia, San Juan de la Maguana and Elías Piña provinces were all among towns in the weather alert. This latest storm is expected to cause rivers and streams to rise and possibly bring floods and landslides to the affected areas. Along with the rain, thunderstorms are expected. The Dominican Republic has some of the most impressive thunderstorms I have ever seen. I like to sit out on the (covered) deck and watch the storm go past. But, along with a good light show, is a greatly increased chance of damage to your inversor (inverter), power regulator, batteries and other electrical equipment in the house. I have a cut off switch for my house where I can disconnect the incoming power line (whether we are currently getting power or not) before it reaches any of my equipment to protect them from power surges. These storms have in the past either came in faster than I expected or happened while I was out of the house and I ended up needing to do a bunch or expensive repairs, so I am pretty diligent about using this switch now. If you haven’t got one installed it’s a good idea to do so. All you need to do is put a double pole, single throw, knife switch in line with your incoming power which you pull down when a heavy storm like the one that caused this alert, passes. A little prevention can save you a day or two without battery backup while you inversor gets repaired as well as quite a bit of expence. (Oct/22/2012) Tropical storm Tony is the second of two tropical depressions that formed over the central Atlantic Monday Oct 22. This depression continued to move in a North-Northeastward direction through Monday and most of Tuesday moving about 14mph with winds at around 35mph. On Tuesday Oct 23 the 11pm AST Tropical Depression Tony was updated to a Tropical storm with winds at 40 mph and tropical storm force winds extending up to 45 miles from the center of the storm, mostly toward the east. Wednesday morning the Tropical Storm (Tormenta) had strengthened to 45 MPH and is moving in a East by Northeast direction at 16 mph. There are no coastal watches or warnings in effect with no hazards affecting land being reported as the storm continues to move away from the United States and the Caribbean Islands. On Oct 11 2012 Tropical Storm Patty formed about 255 miles Northeast of the Central Bahamas. At this point patty has 45mph winds and remained relatively stationary through Sat Oct 13 when it started moving off in a west by southwest direction at 5 miles per hour. At this time patty was also downgraded from a tropical cyclone. Barely reaching the news Tropical Storm Oscar lived its entire life in open sea without causing hazards to land. Oscar became the 15 named storm on Wednesday, Oct 3, 2012 about 1220 miles west by Northwest of the Cape Verde Islands with winds of about 40mph and traveling at 12 mph. Tropical Storm Oscar started to strengthen a little in the morning of Oct 4th and turned East-northeast. tropical storm force winds reached out 205 miles from the center of the storm as it moved North by Northeast at 9mph. Finally on Oct 15 Oscar weakened enough so that it was no longer a tropical cyclone. (9/11/12) There is a new storm in town and her name is Nadine! Fortunately it looks like Tropical Storm Nadine (soon to be Hurricane Nadine?) is not likely to affect the Dominican Republic much. Tropical Storm Nadine formed in the open Atlantic and is continuing to strengthen as it heads in the general direction of Bermuda. It is possible that Nadine will reach hurricane strength as early as Thursday or Thursday night, although at this time maximum sustained winds are only at about 45 mph. The current path of Tropical Storm Nadine is a west-northwest direction and it is moving at about 17 mph. During the next couple days the storm is expected to shift to a northwest direction so that it may bypass Bermuda. For at least the next 48 hours Tropical Storm Nadine is not expected to cause any hazards to land, so there are no coastal watches or warnings in effect. Likewise even the most Eastern parts of the Dominican Republic like Punta Cana are unlikely to feel much from this tropical storm even if it becomes a hurricane.